For every recovering addict there is a 12-step program that can help set them on the path to healing and transforming their lives. While all 12 steps are vital to the recovery process, there are three steps in particular that set the tone for all else the addict must do to free himself of the addiction. We will look at these three steps from a Biblical perspective to see why they are so critical to the healing process. 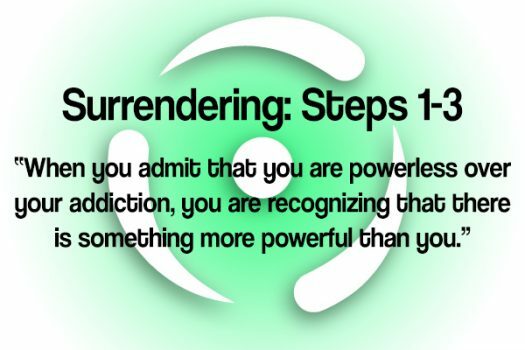 Step 1: We admit that we are powerless over our addiction; our lives have become unmanageable. Contrary to popular culture, especially in America, which tells us that we must always be strong, independent, take charge of our destiny and do everything ourselves, the first and most important step for the recovering addict is to admit being unable to control the addiction alone. This is a terrifying prospect for many; who wants to admit that they can’t do something? But when suffering from an addiction to alcohol or drugs, for example, there must be the realization, no matter how scary, that it is simply not possible to just quit. This is the lie that cigarette smokers tell themselves over and over. They may quit for a time, but usually cave in to the craving that controls them and they resume smoking all over again. We must remember the words of St. Paul who shared with us his own struggle to resist the temptations that he himself faced: “I want to do what is right, but I do not. Instead, I do that which I hate. There is another law at work within me that is at war with my mind.” The war of the mind cannot be fought alone, especially not when it comes to overcoming addiction. Step 2: Believe that a power greater than ourselves can restore us to sanity. Step 3: Make a decision to turn our will and lives to God, as we understand Him. This third step is not only the most vital to the recovering addict, it is also the most difficult. Again, because of the self-centered, egocentric culture in which we live, we are bombarded almost daily with messages to take control, be the master of our destiny and not let anyone or anything get in the way. But when it comes to overcoming addiction, we must do something that is foreign to us: trust someone else to do for us what we cannot do for ourselves. Trust is a real problem for many. Past hurts, betrayals and let-downs can make it virtually impossible for the addict to reach out and ask for the help he so desperately needs. In many cases, past hurts by others are what led to the addiction in the first place. How can the addict trust people to help him when he was hurt by people to begin with? There is only one way. The addict must turn to God and realize that God can help in ways that people can’t. God can provide strength and hope that flawed humans can’t because God is without flaw. Faith and belief can provide that light in the dark tunnel and, if we move towards that light, sooner or later, we will find our way out. Step 3 ends the process that has begun in Steps 1 and 2. Leaving from humiliation, from powerlessness, we end up receiving a new direction in life. We are now offered the insurance that we are not alone anymore.